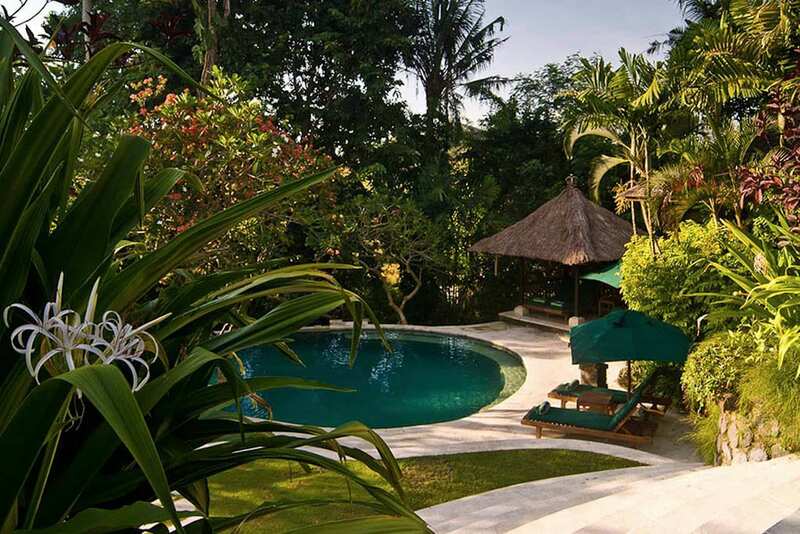 At Villa Bougainvillea it’s all about lush living in both senses of the word. 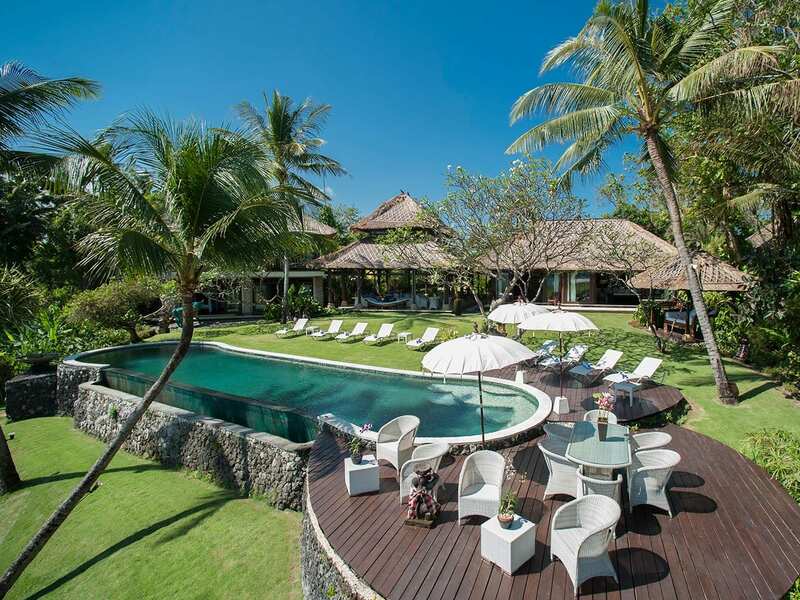 This secluded 3-bedroom hideaway in Pererenan village, just outside of Canggu sits amid beautiful Balinese gardens bursting with tropical greenery and flowers, and the tastefully decorated bedrooms and shared spaces have been designed to blend indoor and outdoor living perfectly. Colorful sofas, day beds and sun loungers tempt you with soft, silky cushions and pillows, antique furniture and artwork is pleasing on the eye, and the 12-meter riverside swimming pool offers an oasis of cool water, dappled sunlight and shade. 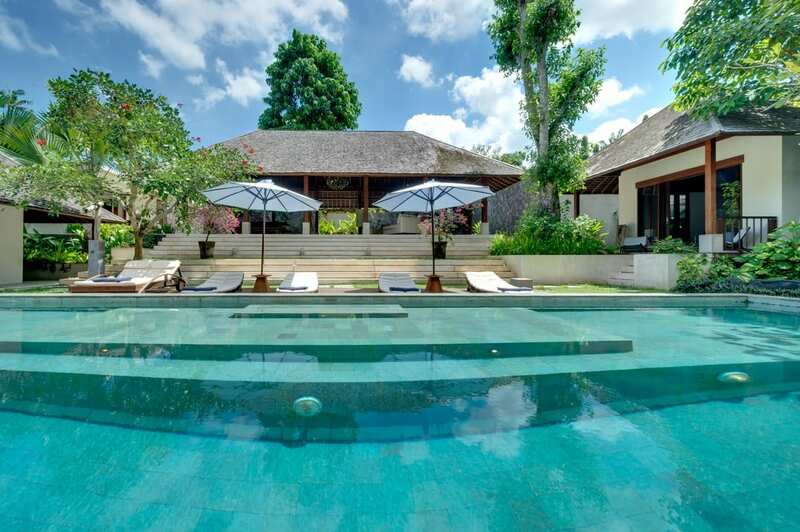 Whether you want to hit up the beaches in Canggu, the shops in Seminyak, or simply relax in your private villa next to verdant rice paddies and the gently flowing river, Villa Bougainvillea offers the ideal Bali holiday experience. 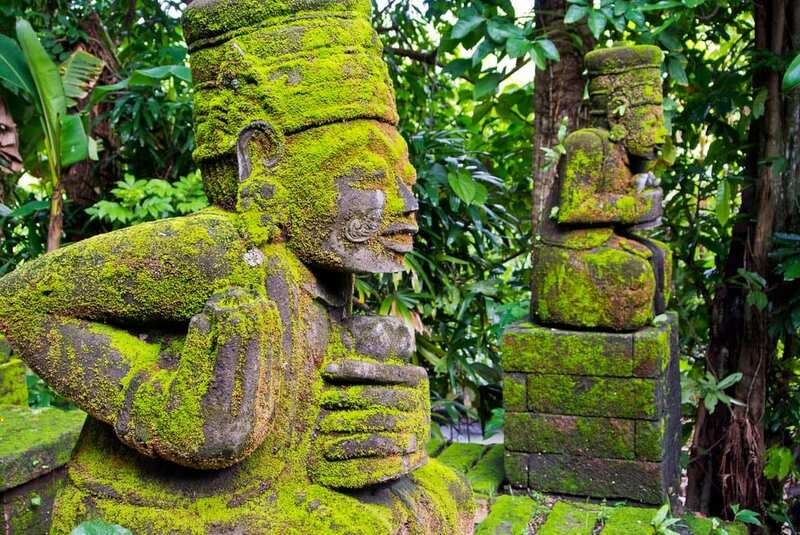 As soon as you step through the Balinese gates and walk down the white palimanan stairs, you enter a world full of life and color. 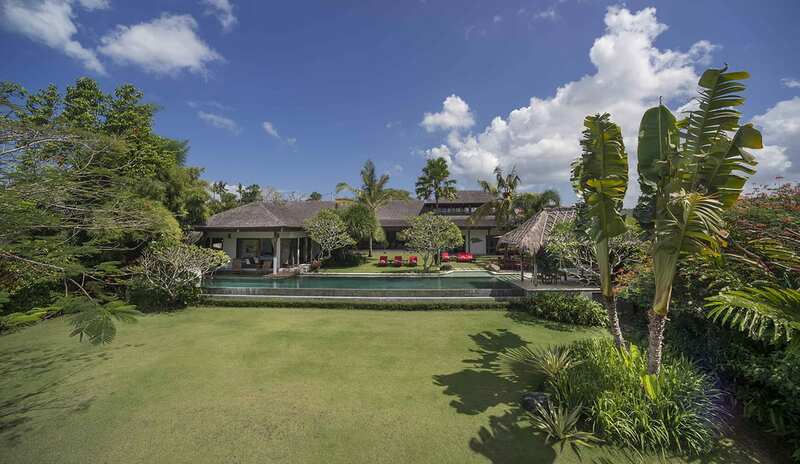 The meticulously manicured lawns here feature a profusion of tropical plants and sweet smelling blossoms, pleasant stone pathways through the gardens, and water features that create a sense of tranquility and peace. 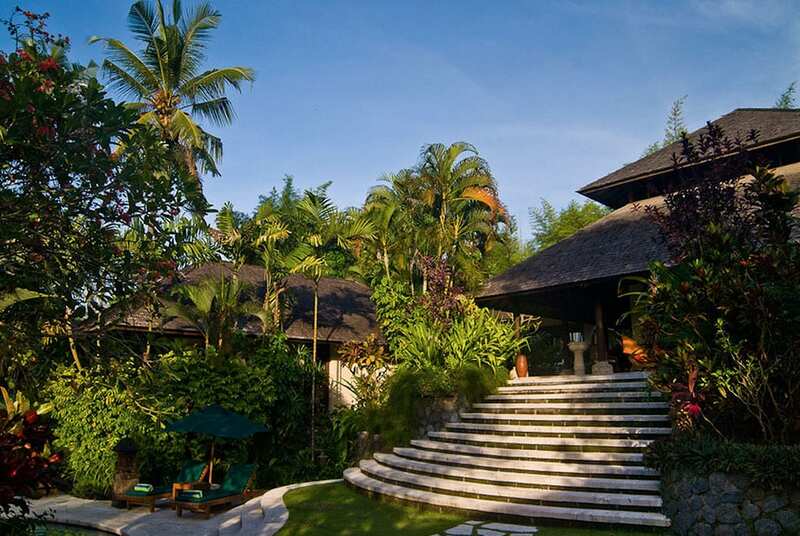 The architecture of Villa Bougainvillea is a mix of Balinese and Dutch colonial, with soaring thatched roofs and solid wooden pillars that allow light and air to wash in. 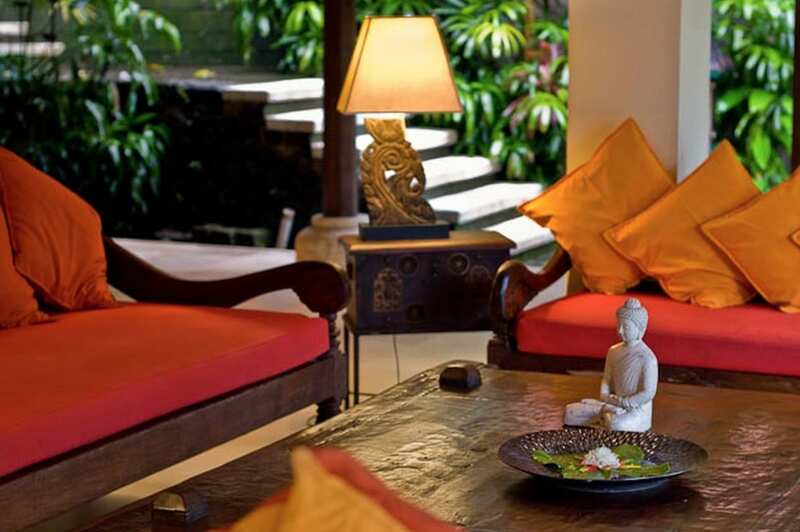 Indonesian antiques, batik hangings and traditional paintings exude elegance, and the modern amenities make you feel right at home. 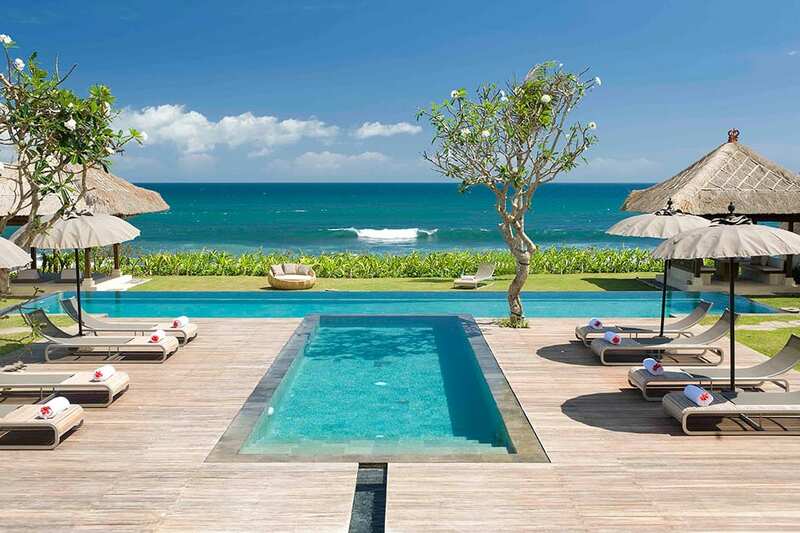 Although the bedrooms are inviting with large windows, cool air-conditioning and plush beds and chairs, you will probably spend most of your days lounging on the sundeck or floating in the refreshing waters of the pool, staring up at the frangipani trees and clear blue skies. 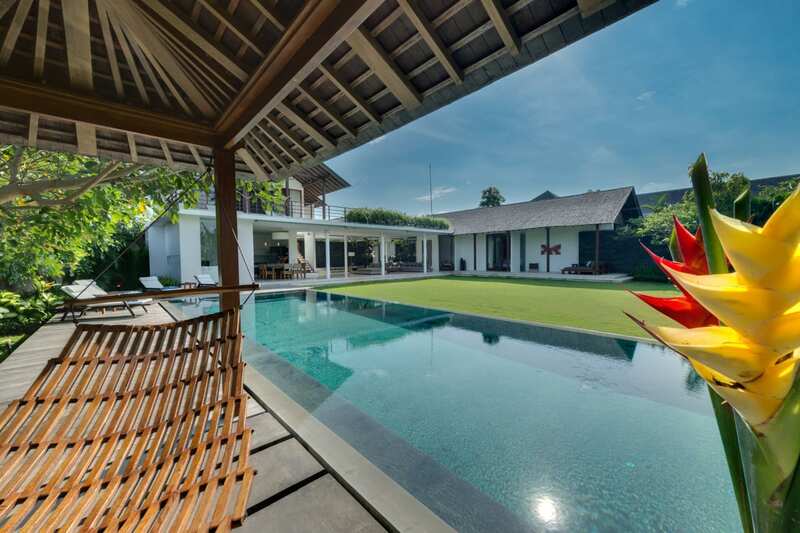 Of course, if you fancy more of a social vibe, the spacious open living area has plenty of sofas and overlooks the lovely gardens, and the large teakwood dining table can seat up to 12 people comfortably. 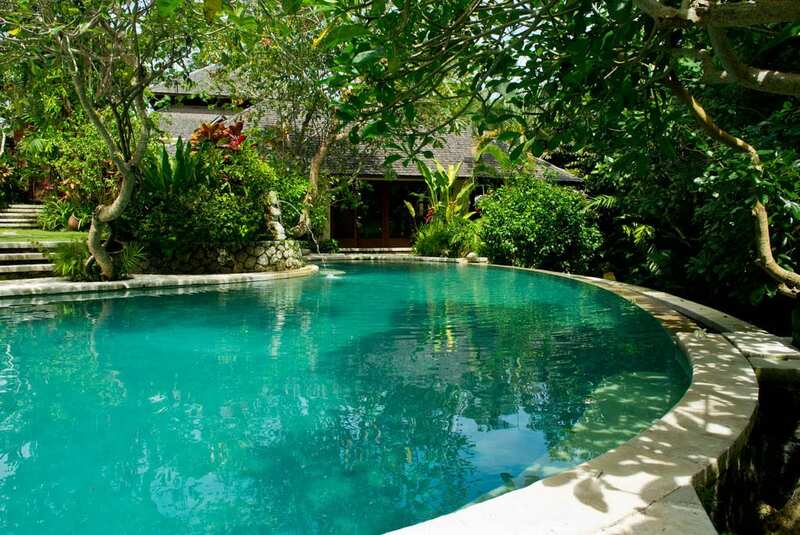 In addition, the talented chef here can prepare a wide range of delicious Balinese and international dishes and the friendly staff are happy to cater for larger parties with advance notice. 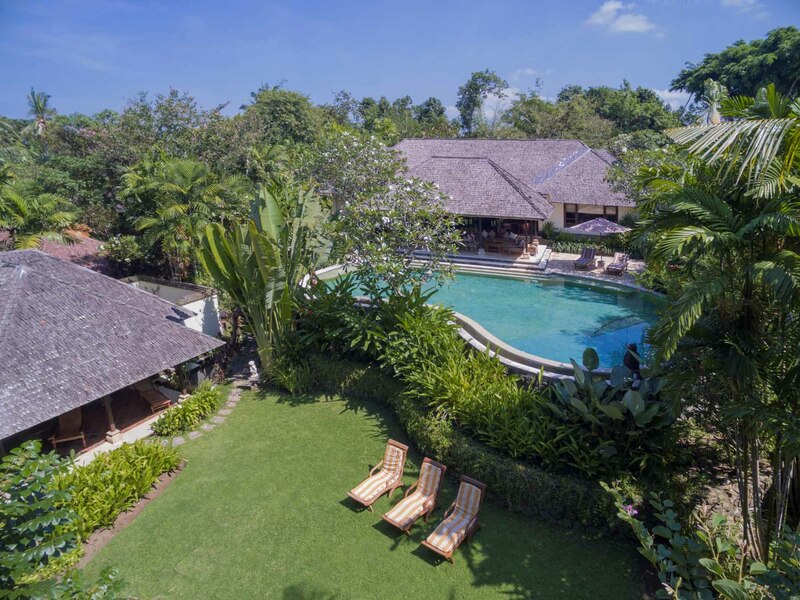 The main living area at Villa Bougainvillea has a 10-meter high ceiling supported by solid wood and stone pillars, and the room is open on three sides to allow light to filter in and gentle breezes to flow through. Beautiful teakwood sofas sport ample cushions and pillows in various shades of orange, which brightens up the room and adds to the already warm atmosphere. 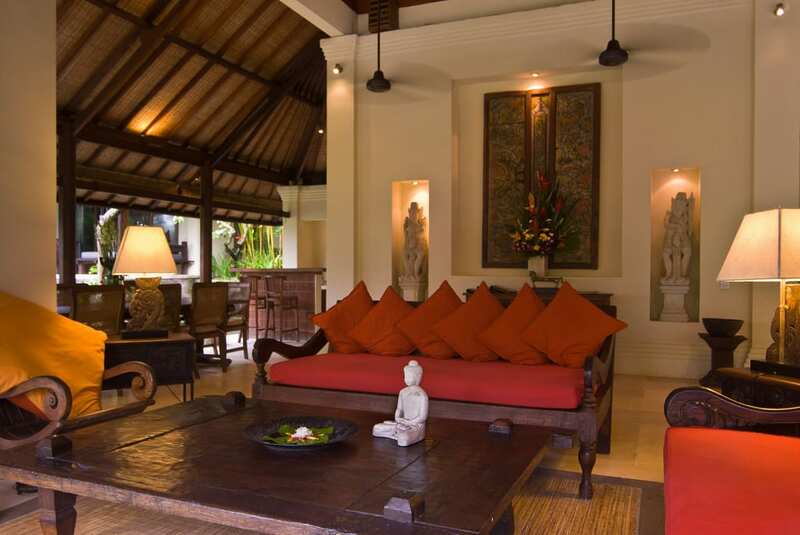 Insets in the walls hold intriguing Balinese statues, Indonesian artwork adorns the walls, and soft lighting and candlelight at night draws you into this charming communal living space. 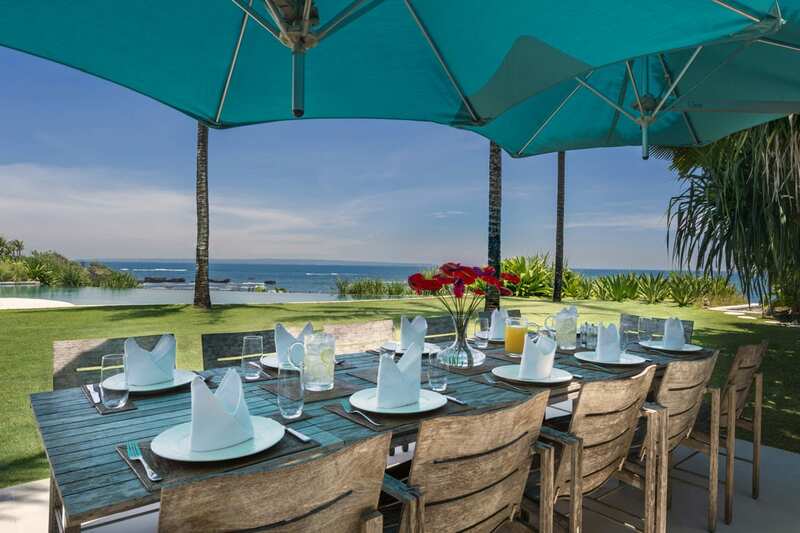 Next to the living room, there is a dining area with a long table that is perfect for families, groups or even couples. Surrounding the table, glass doors provide protection from the elements, although they can also be opened to the gardens so that you feel as though you are sitting in a lush green space. Behind the dining room is a fully-equipped kitchen where the staff prepare exquisite meals with fresh local and imported ingredients. 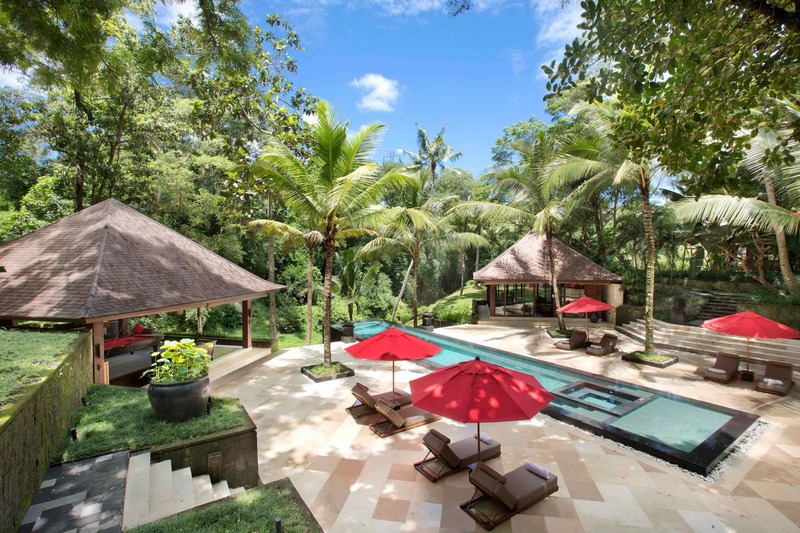 The 3 bedrooms at Villa Bougainvillea are separate from the main building and each other, and can be reached by following tree-lined paths through the gardens. 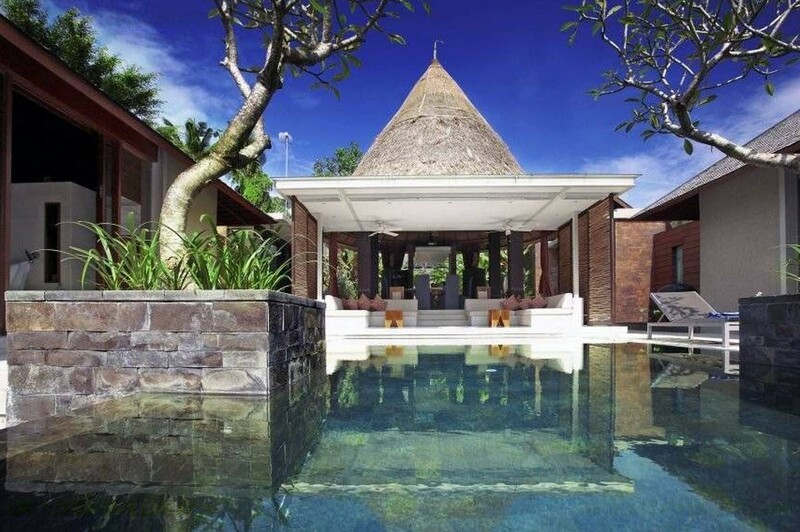 Each room is decorated in a different colour scheme and boasts unique artwork from around the Indonesian archipelago. 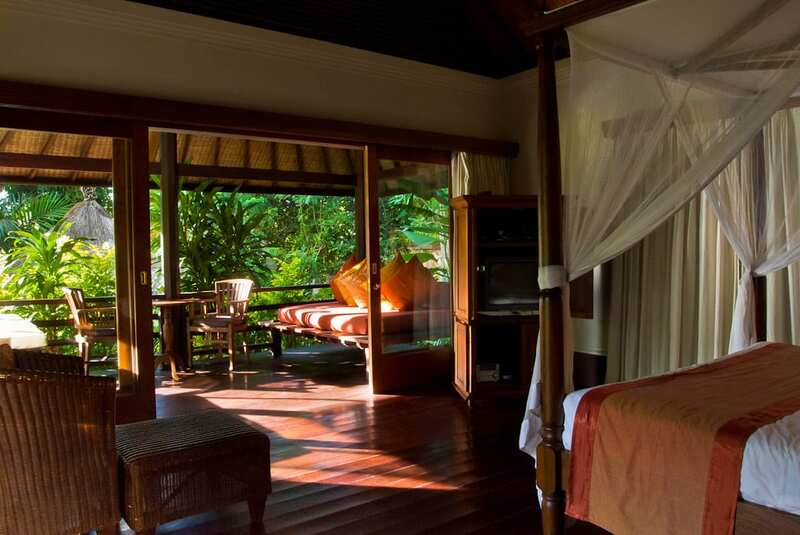 The rooms also feature king-sized beds, balconies overlooking the tropical gardens, spacious ensuite bathrooms with private open-air garden showers, A/C, Wi-Fi, TVs, and DVD players. 3 of bedrooms are single level structures, while the fourth bedroom can be found in a breezy loft space above the TV room that also functions as a study, library and workout space. 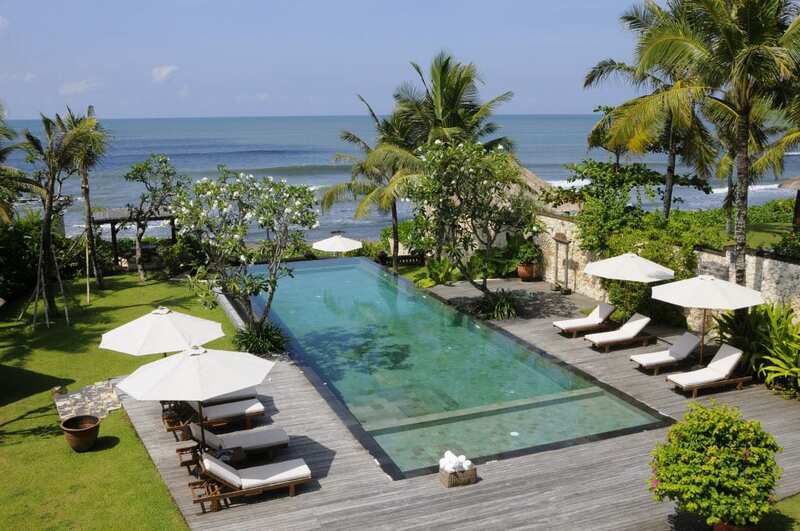 One of the most stunning features of Villa Bougainvillea is the 12-meter pool tiled with aqua and cream colored stones. Around the pool curves a clean white sundeck with sun loungers, umbrellas and a covered bale that makes for the perfect spot for a morning or afternoon massage, meditation sessions or laid-back cocktails. 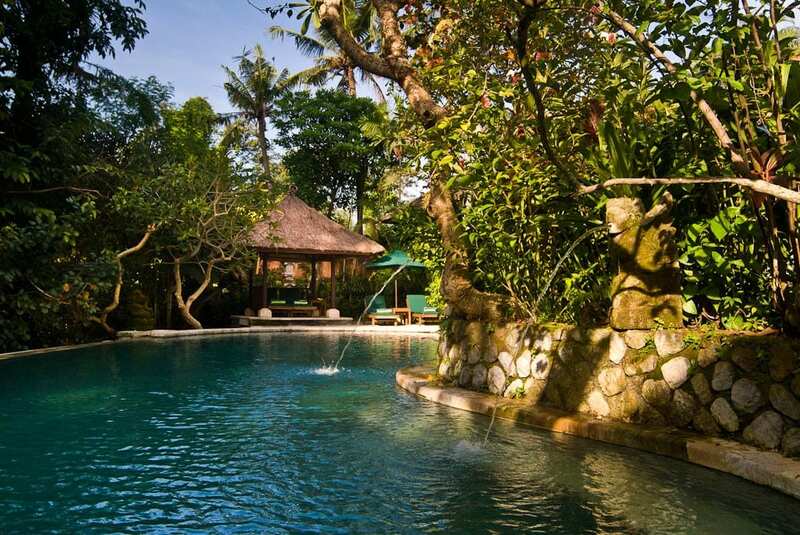 The pool area is surrounded by flowering trees and bushes, which provide shade in the heat of the day and emit intoxicating fragrances in the evening. 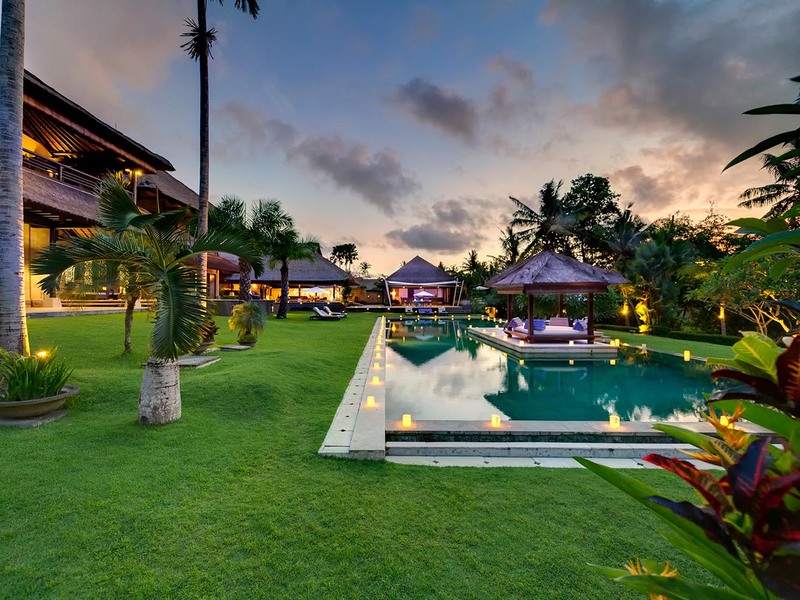 At night, the pool is lit up with glowing lanterns and soft lights illuminate the trees and pathways around the water and the gardens. 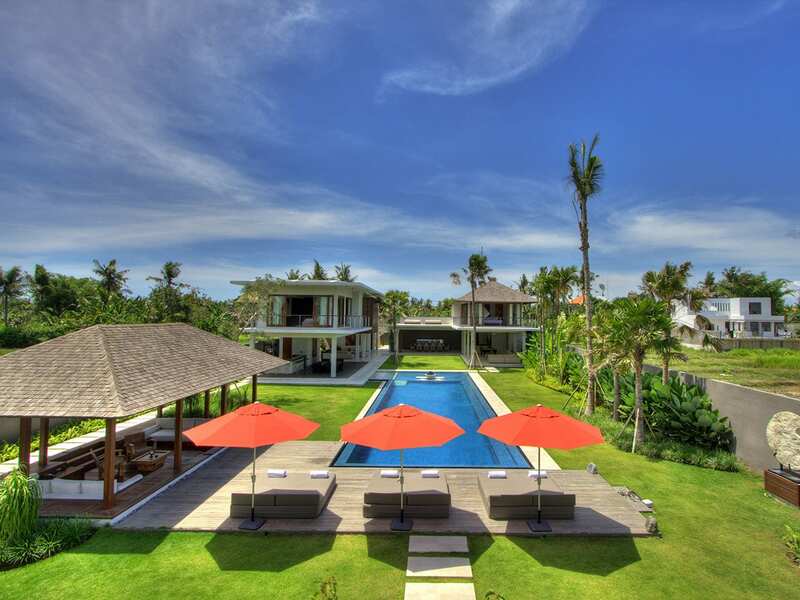 CAPACITY 6 Guests (3 double bedrooms plus additional 4th bedroom on request). 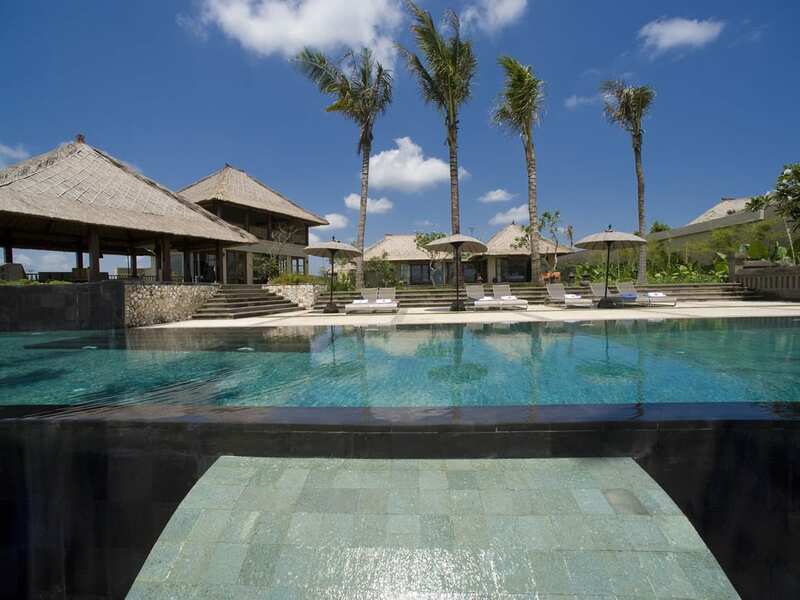 LIVING AREAS Open plan lounge, dining room (seating up to 12 people) and bar, fully equipped modern kitchen, large gardens, infinity pool and bale, alfresco dining, study, media room. POOL 12-meter outdoor, river-side swimming pool. ENTERTAINMENT TV room, stereo, DVD player, DVD library. TRANSPORT Car & driver can be arranged at special rate of USD 35++ per day. 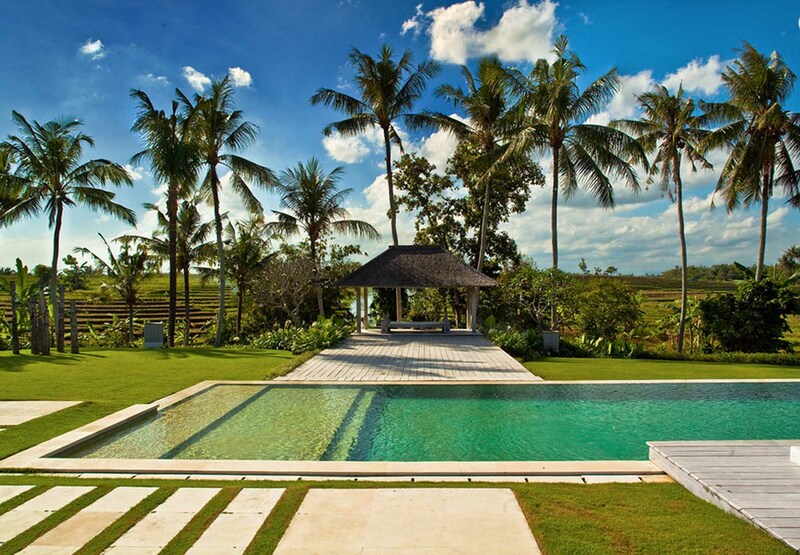 Villa Bougainvillea is located in the lush and tranquil setting of the rice paddies of southwest Bali. 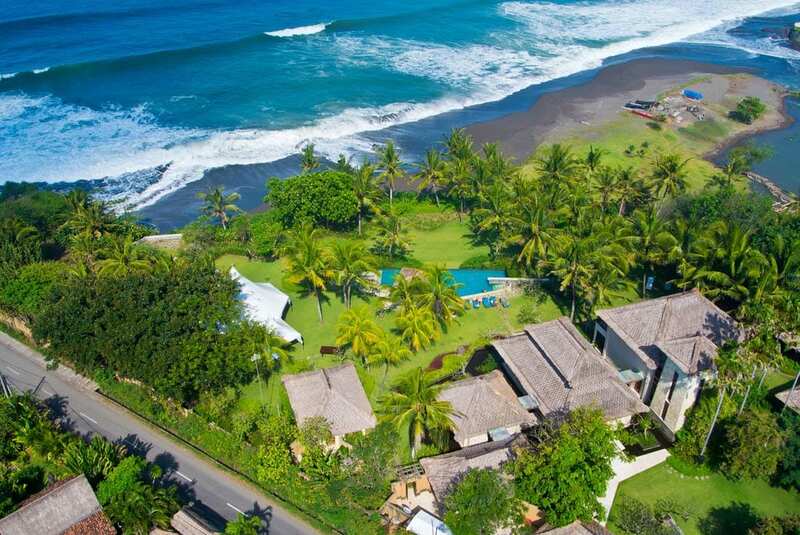 Apart from the wonderful rural countryside of rice-paddies and Balinese villages,Villa Bougainvillea is also set close to the coastline so you can equally enjoy the surrounding beaches. There are a number of great cafes and organic eateries around the area. 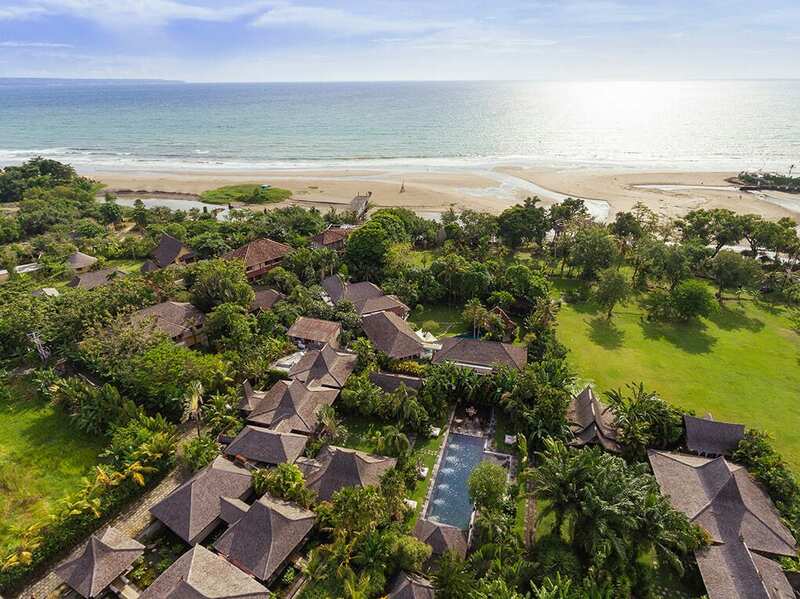 Its location is only 40 minutes from the international airport, 15 minutes to Tanah Lot and 15-20 minutes to the restaurants, shops and nightlife of Seminyak and only 10 minutes from the island's pre-eminent signature golf course, the Nirwana Bali Golf Course. The golf course can perhaps boast the most beautiful location of any golf course in the world. Villa Bougainvillea is just paradise. The standout of the whole experience is definitely the beautiful staff, they are all so welcoming, helpful, kind & thoughtful. The whole place is spotless, bedrooms are dotted around the property allowing every guest their privacy and you gather in the lounge dining area for meals, the garden is immaculate and it is just bliss to lie by the pool surrounded by all the beautiful flowers, trees etc., The meals were all amazing, we kept talking about eating out however earing in was just so good nothing was too much trouble for Made and his team. I genuinely felt very sad at having to leave this beautiful piece of paradise you can feel it doing your spirit so much good just soaking up this beautiful space. Thank you to all the team I am not sure you realise the difference you make to those who visit you. We will be back. We travelled with our children and met other family member in Bali. The wonderful team at Villa Bougainvillea were just perfect during our stay. So accommodating with any of our requests and just lovely with all the children. The grounds were kept beautifully the well established gardens are wonderfully landscaped and maintained. 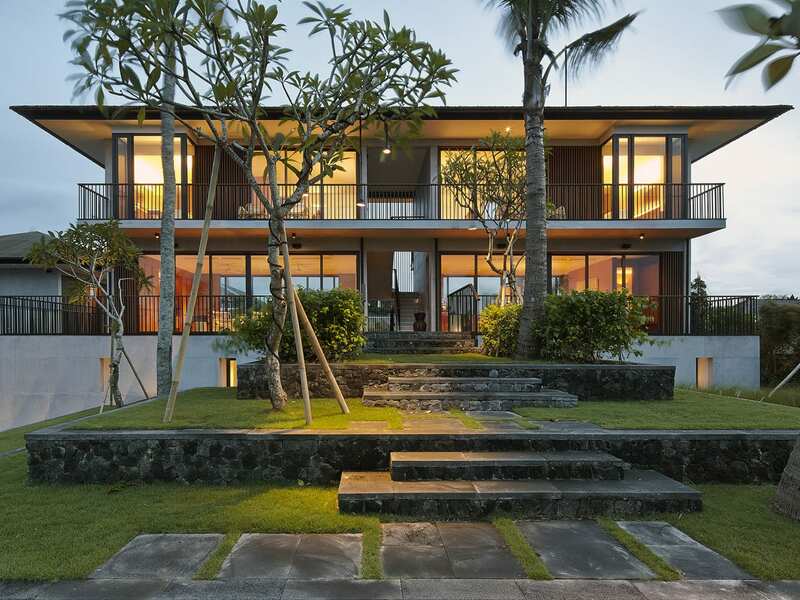 The rooms and main lounge area all fitted out in true Bali style and again wonderfully maintained and cleaned! Our meals were all cooked so very well by Made and his team. 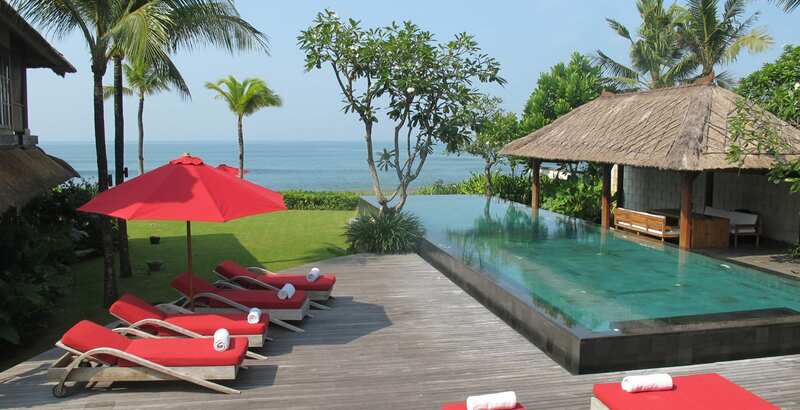 Cannot fault them at all - we can't wait to stay again! our opulent home away from home!